is made using rice bran as the base material that has been sprayed with a group of highest quality bacterial cultures that it’s teeming with billions of live microbes, ready to ferment and compost your food scraps. 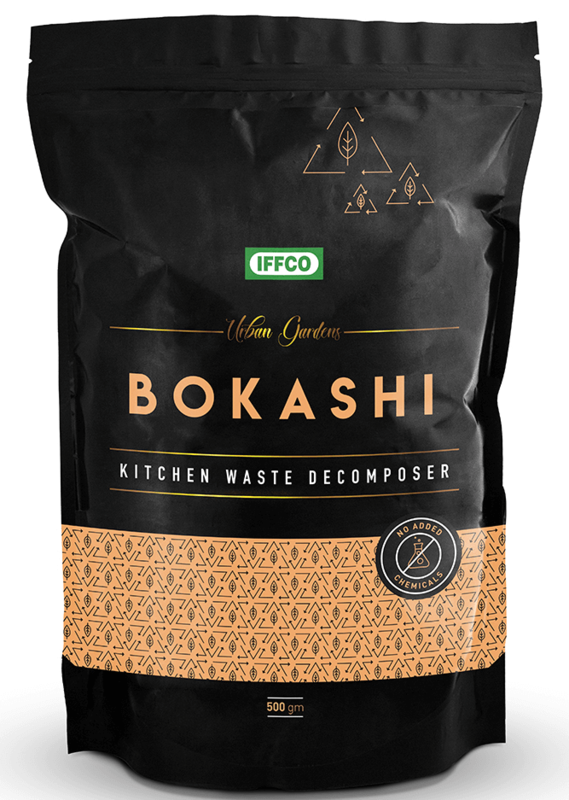 Bokashi helps in accelerating the breakdown process of kitchen waste into fertilizer. The product controls unpleasant odors. This product is used as a compost accelerator and odor control amendment yielding organic fertilizer. Our strict production process ensures that the Bokashi bran is always of optimal quality and fresh, before delivering to your door. Turn your kitchen waste into superfood for your garden, lawn or house plants. Faster and efficient home compost maker. Bucket/Container required with lid, tap and sieve to be able to drain the liquid generated during the process. Add food waste into a container/bucket after placing sieve inside and cover with lid; press it down to ensure maximum space utilization. Sprinkle bokashi on the waste ensuring complete coverage. Slightly press down the first layer and add new food scrap layer sprinkled with Bokashi bran, repeat this process whenever making a new layer of food scraps. Repeat above process till bin is full and then keep aside for 25 – 28 days. After every 3 to 4 days, drain the liquid that has accumulated at the bottom of the bucket, liquid can be used as fertilizer. The liquid should be diluted with water 1:100 ratio that is 1 Litre of Bokashi liquid should be mixed with 100 Litres of Water and used as foliar spray on plants. To make Bokashi soil fertilizer, remove the compressed fermented material after 4 weeks from the bucket. Dig a hole or trench about 10 – 12 inches 25 to 30 cm deep. It should not touch the plant roots as the pH level of Bokashi compost being acidic. Pour the fermented material from the bucket into the hole or trench and mix with the soil/soil and coco peat. Cover with 8 – 10 inches 15 – 20cm soil. Plant into the Bokashi enriched soil 2 – 4 weeks after it has been buried. Fermented Bokashi material mixed with soil/coco peat is a great fertilizer for plants. Close the Bokashi packet after every use. Avoid adding liquids like (milk, juices, water), plastic and paper wraps, meat bones. Formation of white mold/fungus on the top layer of food scraps after adding the Bokashi bran indicates a positive reaction.